How to measure the practically immeasurable rotations of the doors in the façade of the Storefront for Art and Architecture? How to describe the blurring of boundaries that occurs when its doors are (semi)opened? How to quantify the seemingly infinite interaction between the institution and the city? 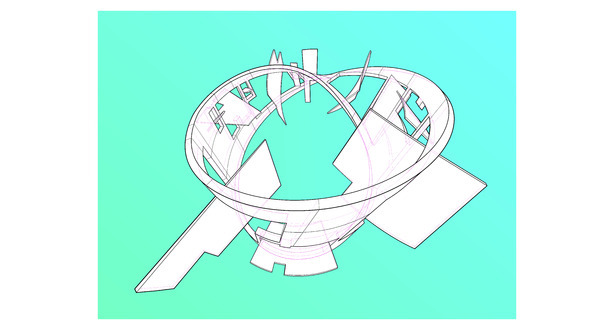 Rather than quantifying an exact measurement of these rotations in time, this drawing makes use of the number π to represent Storefront’s social interface—its façade—as an endless loop; to qualitatively “measure” the relation between inside and outside, between architectural pidgin and street talk, between architecture and the city. Donated by : Kohn Pedersen Fox Assoc. Please note that all works are shipped at the buyer's expense. There is a New York Metropolitan Area standard fee of $30 for delivery. Otherwise, picking up your work is encouraged. Winning bidders are bound to purchasing artwork and to the terms outlined above. Payment must be remitted within two months of bidding close.